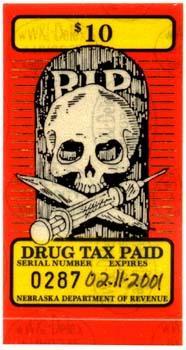 The Marijuana Tax Act was imposed between 1937 and 1969 as an annual occupational tax, with payment reflected by a special tax stamp, on those who dealt in or possessed marijuana. It also imposed a tax upon all transfers of marijuana, with stamps reflecting payment. The Supreme Court held the Act unconstitutional on self-incrimination grounds in 1969. Beginning with Arizona in 1983, a number of states have revived taxation of marijuana and other illegal drugs as part of a new “War on Drugs”. 23 states have used revenue stamps to evidence payment of the tax. Tax rates for harvested marijuana range from $10 per ounce (Arizona) to $100 per gram (Nevada). A few states tax unharvested marijuana plants separately, at rates ranging from $134 per plant (Arizona) to $1000 per plant (Wisconsin and Kentucky). Payment does not legalize the marijuana, and dealers reasonably fear disclosing their profession. Compliance with these laws thus has been minimal, with most stamps having been sold to collectors. In only Arizona, Kansas and Oklahoma are stamps known to have been found “on piece.” Also, most states ban sales of used stamps, so virtually all collectible marijuana stamps are unused. In addition to the states which used tax stamps, at least five other states have taxed marijuana, but did not use stamps. Florida, Montana, and New Mexico have repealed their drug tax laws. Georgia and Indiana use receipts. Local efforts which did not use revenue stamps and soon were abandoned. State Revenue News, 1995 Vol. 33, No. 3.